As someone who always wanted to be an architect but couldn't do the math, I've always had a fascination with buildings, especially public buildings. And in my lifetime I've watched them become dull and boring. No, it's not a conspiracy man, it just has to do with spending taxpayer's money. 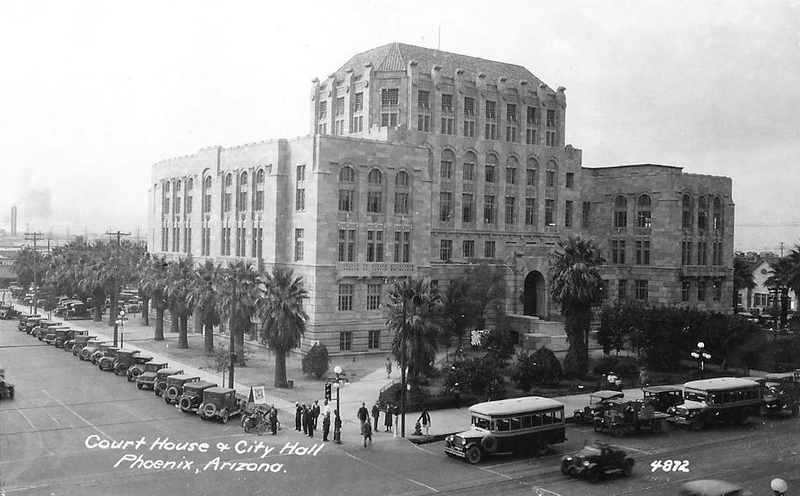 Elaborate, expensive buildings had been getting a lot of backlash from taxpayers who were complaining that they were a waste of money, and by the 1980s, cities like Phoenix had heard. And the trend turned into seeing if a public building could be made to look as if it had been built as inexpensively as possible. This pleased a lot of taxpayers, but for people like me, it was a disappointment. There was a time, before I was born, when taxpayers were happy to have their money used to promote and beautify their city. The thought was that in the long run it would be good for the image of the city, and would bring in more business, more jobs, more prosperity. And as an old Marketing guy, I can understand. Cities are like anything else, judged quickly, on appearance. Bright and shining buildings not only are expensive, they look expensive, and prosperous, like meeting a man in a nice suit, or a woman in a beautiful dress. OK, I'll admit that I never earned enough money in my life to be all that concerned with taxes. I've known a lot of "deep pocket" people who sadly watch the government take away up to a third of their income, and that's gotta hurt. I've never been in that bracket, so I don't know. And those wealthy people have very strong voices if they feel that the money that's being taken from them is going to waste. So fancy buildings, elaborate art displays, and anything else that looked like it cost a lot started to fade away. I won't point out any buildings in Phoenix, for fear of making it look like I'm criticizing them, but many were built to look as if they were built on a very tight budget. The elaborate marble columns were gone, and replaced with a lot of plain-looking "exposed" materials. It's a matter of taste, but I kinda like the old stuff - you know, that said "ta da!" Image at the top of this post: Maricopa County Court House and City Hall in the 1930s, 1st Avenue and Washington, Phoenix, Arizona.